The other day I was reading an article about how in this day and age, true love is waiting to binge watch TV shows with your significant other. Let me tell you what true love looks like in my house. On Thursday night after Mike and I had a really large lunch with a friend, we decided to skip out on eating a real dinner. Mike said he wasn’t hungry but I was feeling munch-y so I made myself some nachos. I asked if he wanted any, but he didn’t, so I went to it, eating all the best parts – you know, the cheesy bits with loads of stuff on top. Later, after my nacho binge, I left the baking sheet on the counter, with the sad rejected chips that had no cheese. I fully intended to clean it all up, after I came out of my food coma. I got caught up in watching some random show on TV and hours later, when I went to the kitchen to clean up, everything was gone. “So sweet,” I thought to myself, “Mike must’ve cleaned up for me!” Turns out he wasn’t really cleaning up in the literal sense of cleaning up. He just ate the leftover non-cheesy chips. I felt horrible! Everyone knows that you’re not supposed to eat all the good bits yourself! It was completely selfish of me. But then again, he did say that he didn’t want any. Anyway, just wanted to say: in this day and age, yes, true love is waiting patiently for your schedules to sync up so you can binge watch shows together. But it’s also eating the sad leftovers your wife leaves for you after eating all the choice bits herself. 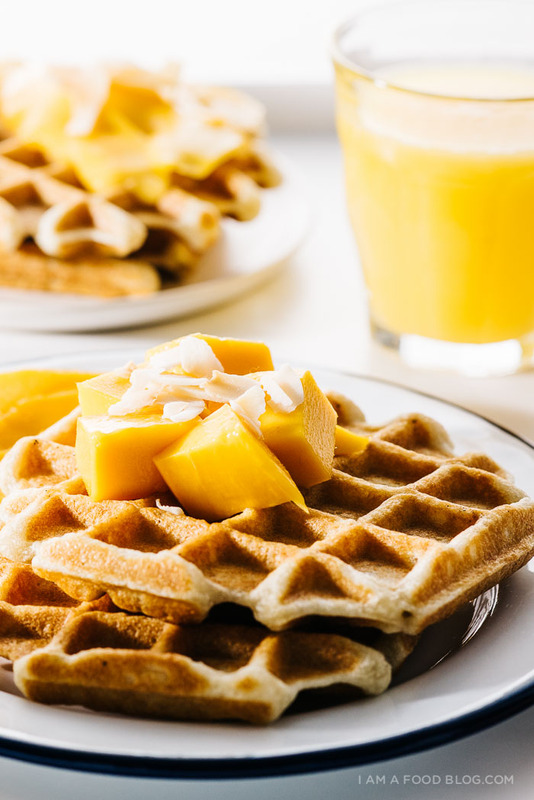 I made Mike these waffles to make up for it but they didn’t really go over that well because, well, Mike doesn’t actually like mangos. Oops. Don’t worry – fried chicken is on its way and I’m going to leave him ALL the drumsticks because those are his jam. In a bowl, mix together the flour, sugar, baking powder, baking soda and a pinch of salt. In liquid measuring cup, whisk together the melted coconut oil, coconut milk and egg. Add the wet ingredients to the dry, stirring until just combined. 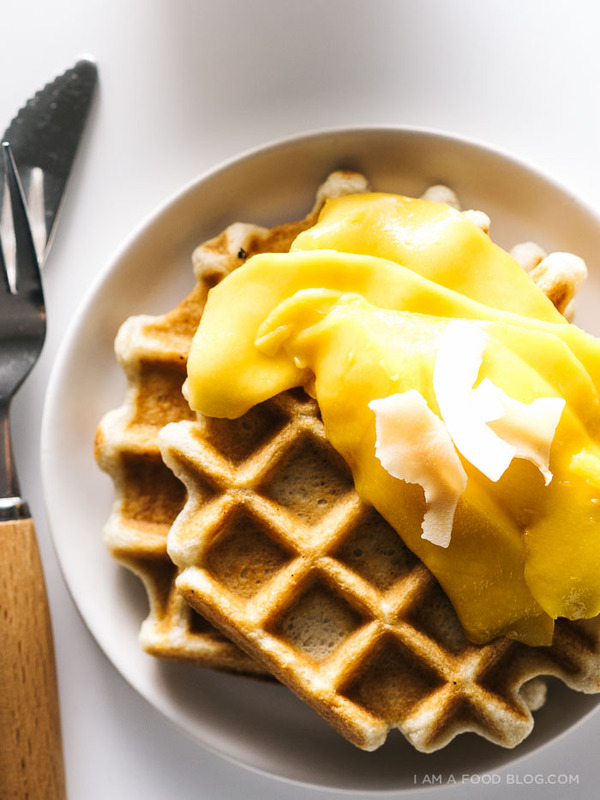 Let sit while you heat up your waffle iron. 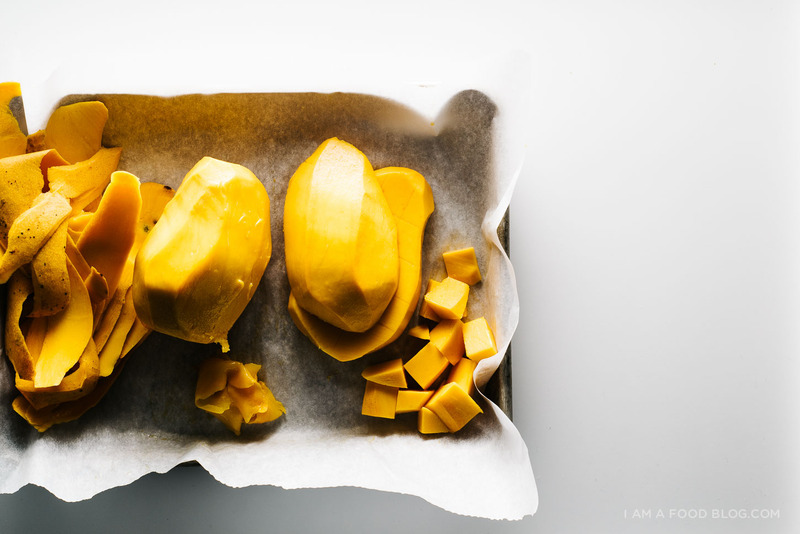 Serve with sliced mangos and cream and syrup, if desired. Oh yum! I (unlike Mike) love mangoes, so I think these will be very happy in my tummy (especially with all that coconut going on). I keep saying we can’t buy any more kitchen appliances but we don’t have a waffle maker and I reallllly want one! It’s definitely the first on my list when we decide to lift our appliance moratorium. I read that binge watching article too – I drive my husband crazy because I’m usually the one who says we should stop watching. We end up watching a lot of shows separately because of that. I AM almost done all ten seasons of Friends though so apparently I have no problems watching that ;). Good gracious woman. 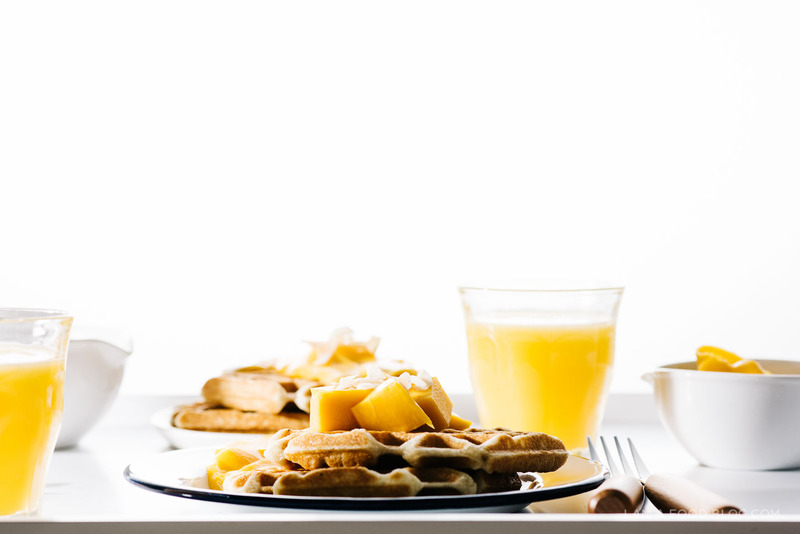 True love is these waffles. This is brunch HEAVEN!! 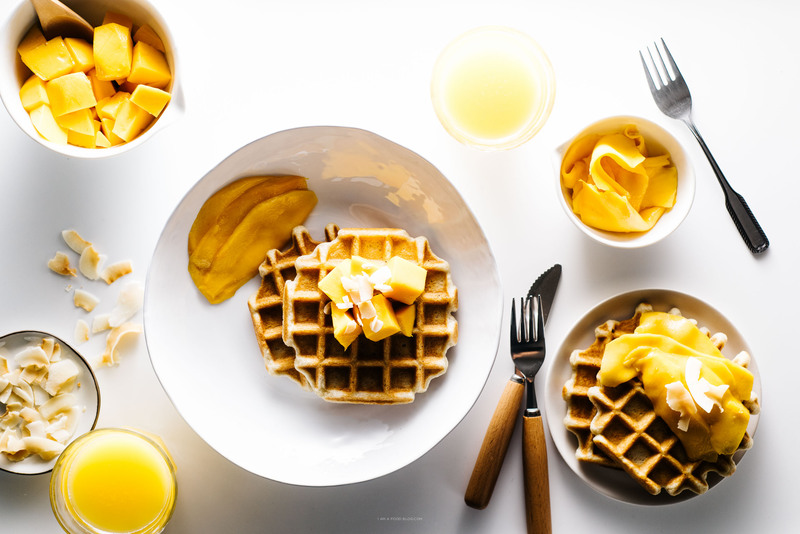 Ahhh coconut and mango are one of my favorite combos ever — this is perfection. Now if only I had a waffle maker! And bahaha awww the nacho story. At least the chips got “cleaned up” and now he has drumsticks coming for him too — win win!!! This is the best ‘Sunday Brunch’ yet, Steph! 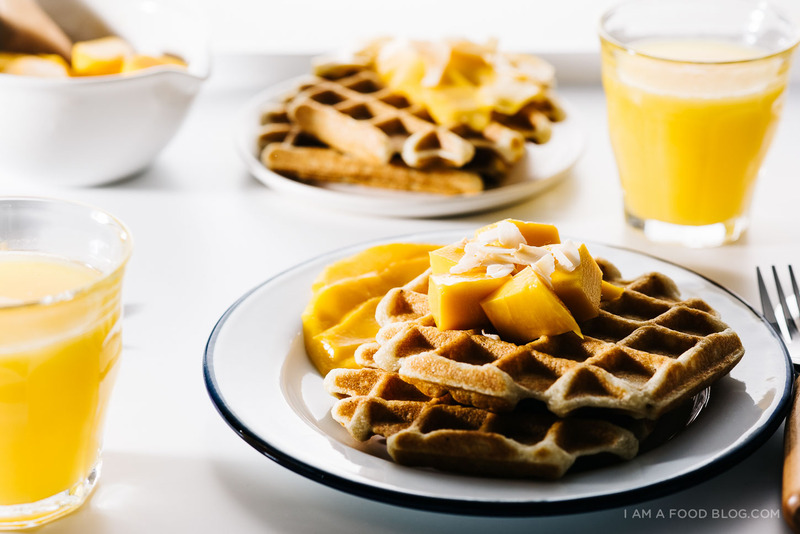 Your photos are amazing, and that mango… yum!!!! lol, i’m just loling at your nachos story over here, lol. don’t mind me. 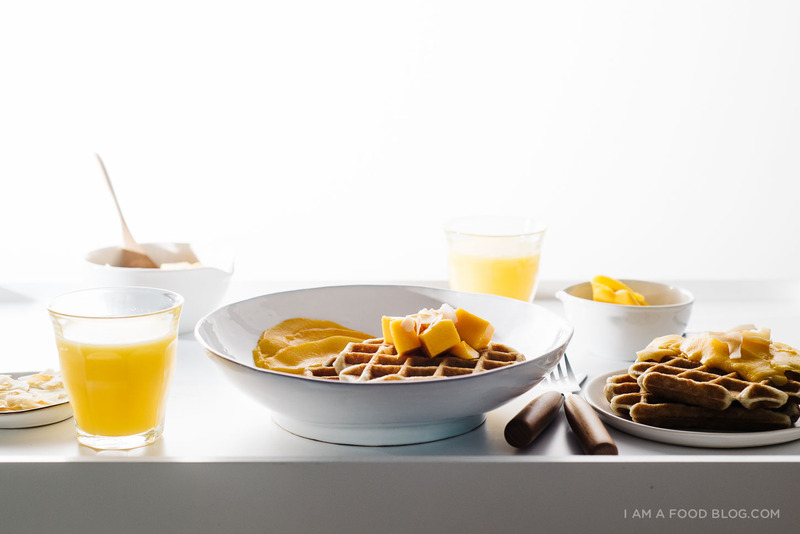 ps — love these waffles. Ahhh so cute!! I love those little things. My boyfriend never texts me after 7pm because he knows I have to be in bed so darn early for work and doesn’t want to wake me up (I totally would wake up and reply to his texts and stay up for an hour texting). Little things like that are really special! You and your hubz make me so happy. Totally remind me all the time that true love exists. HAHA to the nacho story and then the waffle story and hooray for chicken!! 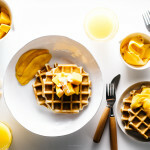 These waffles are totally MY jam cause I love mango + coconut all day every day! 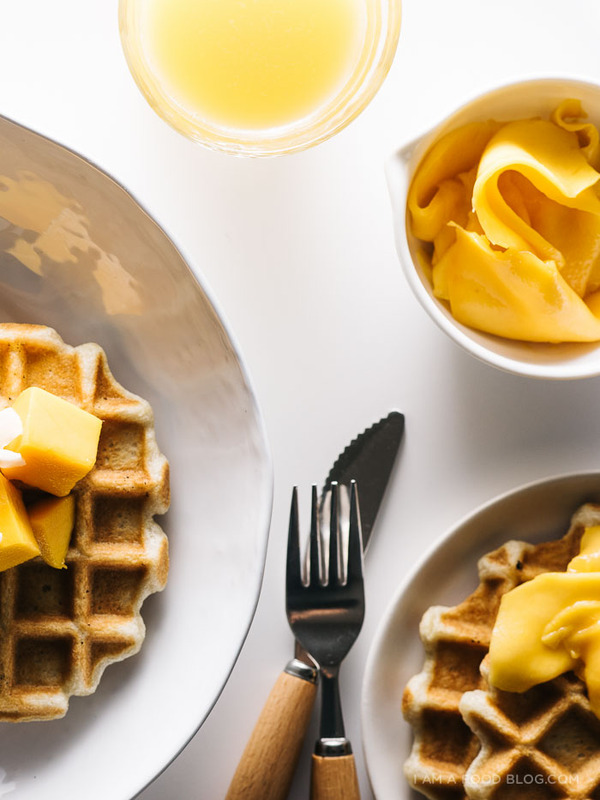 Coconut and mango is definitely one of the best combos ever + these waffles look like pure sunshine! I am SO into this making brunch at home thing! And mango has been on errrrrrrything in my life these days. These are PERFECT! Why don’t I own a waffle iron?? I’m going to have to run out and get one, because this recipe is calling my name!! Love your blog and photos! 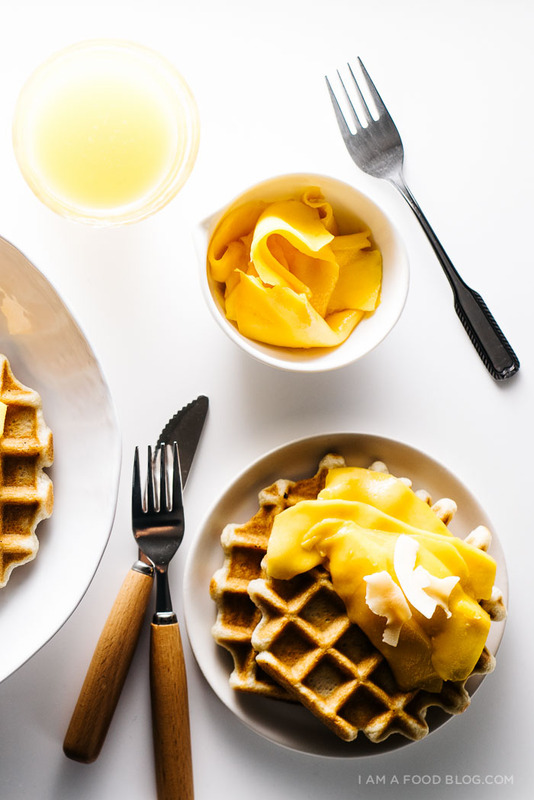 I’ve been looking for the perfect waffle recipe and I think this might be it. What kind of coconut milk did you use for this? The canned kind used for curries, etc or the stuff that comes in a carton like soy milk? Thanks! I used the canned kind!